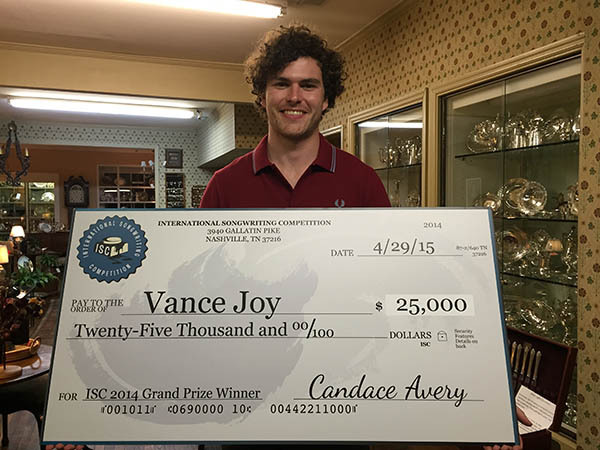 May 1, 2015 – The International Songwriting Competition (ISC), widely recognized as the most prestigious and respected international songwriting competition in the world, has today announced its 2014 winners. With over 18,000 entries submitted from 118 countries, a total of 345 songwriters are honored in the competition. “It is such an honor to win this songwriting prize,” Joy said in a statement. “Writing songs is what gives me a feeling of purpose. I’m proud to receive this award voted on by my songwriting peers.” The Grand Prize winner receives $25,000 in cash plus $45,000 in services and merchandise, including a custom-built Lowden guitar valued at over $11,000, a Hammond organ, Abelton Push and Live 9 Suite, and much more. Created in 2002, awards more than $150,000 in cash and prizes to winners of the competition. Winners range from amateur songwriters who are just starting their careers to professional songwriters who have years worth of experience. Previous ISC winners include Bastille, Passenger, Kate Miller-Heidke, Lindsey Stirling, Gotye, The Band Perry, Kasey Chambers, Gin Wigmore, King Charles, Kimbra, Gregory Porter, Omar Sosa, For King & Country, and many more. ISC is sponsored by: Lowden Guitars, Hammond USA, Abelton, Gauge Microphones, Slate Digital, DiscMakers, D’Addario, Taxi, IndieProMix and FinalMix, Inc., Indie Venue Bible, George Stein, Esq., Berklee College of Music, Thayers, AirPlay Direct, Celebrity Access, SongU, The Music Business Registry, Lurssen Mastering, and Vosges Haut-Chocolat.